Sometimes we leave the ivory tower, and crawl out of the lab dungeons into the light. Here a few snippets of such occasions. 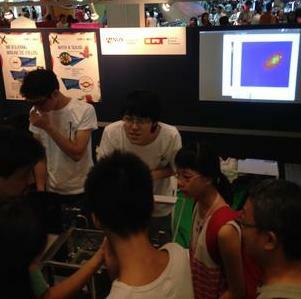 Giving CQT's spin on sensing magnetic fields to the shopping center crowd at X-periment! 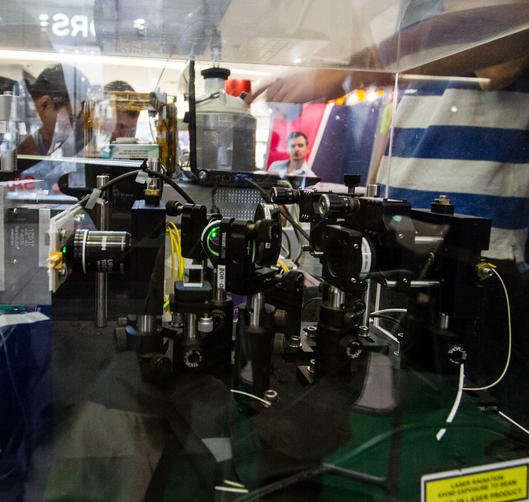 2015 in Vivo city, Wilson managed to bring the confocal microscope looking at single NV centers in diamond on stage, and did a live show of one of them. 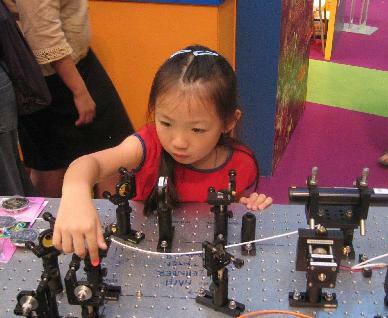 A cool preview of how small quantum technology sensors for magnetic fields can be... although we could not resist bringing in some magnetic field toys people are more used to, including compasses. Was great fun to have our colleagues from Rainer Dumke's team around showing a SQUID - and having some fun with liquid nitrogen! 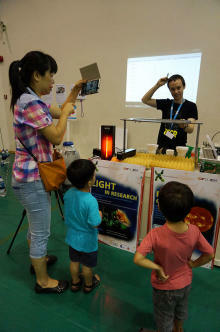 We flocked around at Singapore Mini Maker Faire 2013 at the *SCAPE warehouse on 27 July, showing some of the basic tools & toys we use and often make in our labs. A new setting for us, trying to find other makers. 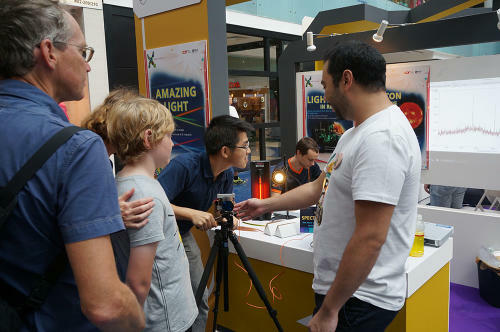 Similar to earlier events, we demonstrated live some of the weird aspects of quantum physics: light showing aspects both of waves and particles, and entanglement for pairs of photons. 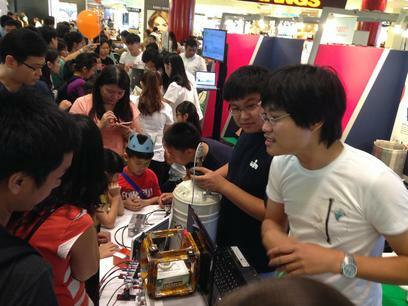 Again joining in science in shopping centre idea in Singapore, young and old came along and violated a Bell inequality in Marina Square from 30 July to 1 August 2010. Despite Singapore being a fine city, a violation rendered a certificate, not a ticket! We also prepared a page for the geeks with some of the gory details. Back on the road with the vintage PDC source! 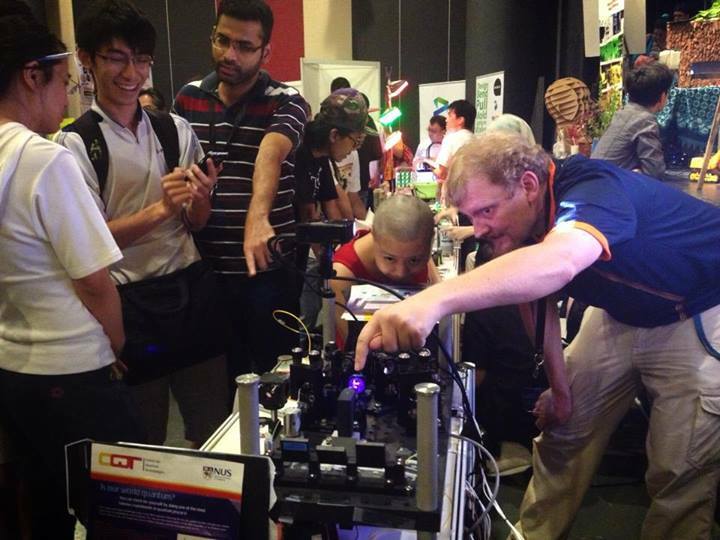 Again we went to Vegas to show some hardware together with the NIST guys. 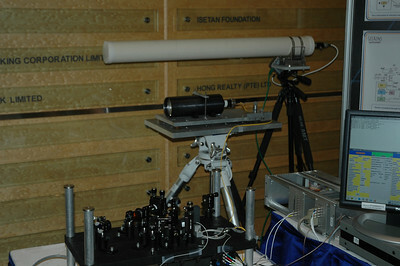 We showed the basics of how to fool a single photon detector into "clicking" at the request of an eavesdropper and set up a fun fair competition for the DEFCON participants to see who could achieve the highest violation of a Bell inequality by carefully aligning the measurement basis. 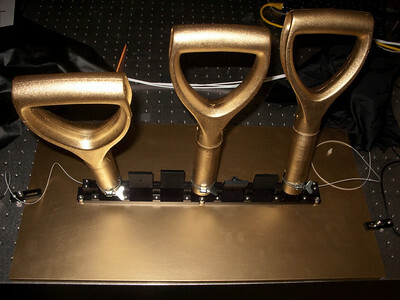 The Golden Handles were connected to a very fiddly polarization controller. 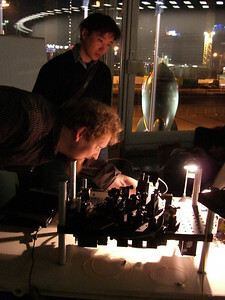 After that Ilja joined up with Vadim in the Netherlands and presented the hacking setup to yet a different audience in Hacking at Random. 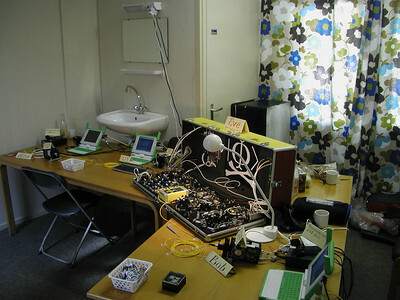 After that, we went on tour with our equiment at an off-site location nearby. Check out this longish video clip about this detour. Read more about this overseas experiment. 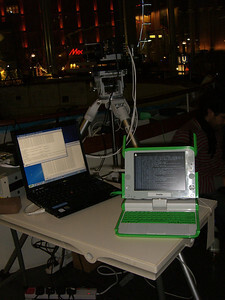 Cryptography is only as good as you are willing to expose it to those who know how to break it - in this spirit, we brought our QKD kit to the big European grassroot geek event, 24C3 in Berlin in 2007. 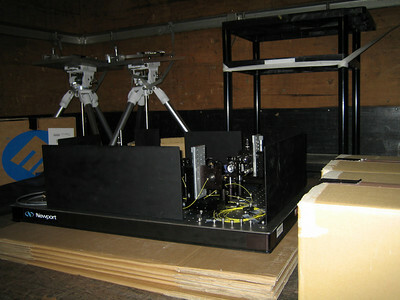 To all our surprise, we got it running right out of the - admittedly large - box! 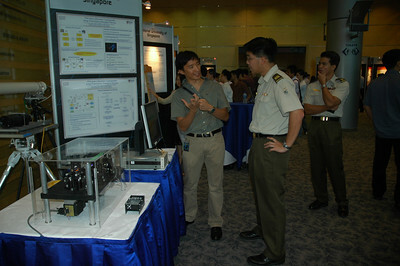 We exhibited our crypto system on NTU campus for the DSTA Defence Technology exhibit in 2006.